Kente, a hand cut glass mosaic shown in Athos, Juhl, Blair, Rhode, Rolly and Obsidian, is part of the Erin Adams Collection for New Ravenna Mosaics. Dachshund bookends are from Jonathan Adler. Flowers, a waterjet glass mosaic shown in Sonia, Rolly, Sardonyx and Alexander, is part of the Erin Adams Collection for New Ravenna Mosaics. Daisies, a waterjet glass mosaic shown in Greta, Rolly and Labradorite, is part of the Erin Adams Collection for New Ravenna Mosaics. December 10, 2013 (Exmore, Virginia)….. Pantone has announced their 2014 color of the year, and the magical hue called Radiant Orchid can be found in several of the mosaics that Erin Adams has designed for New Ravenna. 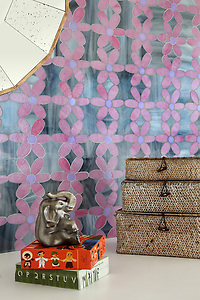 The Erin Adams Collection has three designs which include this vibrant shade of purple; Daisies, Kente and Flowers. In each jewel glass mosaic Adams has used deeper colors as contrast to the vivid hue. The Erin Adams Collection is available in jewel glass or natural stone. In glass it is suitable for vertical interior installations. In stone, the mosaics can be installed indoors or out on both floors and walls. New Ravenna Mosaics tile is available in showrooms throughout the United States, Canada, Europe, Dubai, and Russia. Kente, a hand cut glass mosaic shown in Athos, Juhl, Blair, Rhode, Rolly (same hue as Radiant Orchid) and Obsidian, is part of the Erin Adams Collection for New Ravenna Mosaics. Dachshund bookends are from Jonathan Adler. 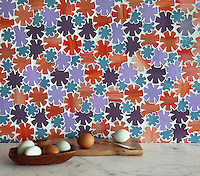 Flowers, a waterjet glass mosaic shown in Sonia, Rolly (same hue as Radiant Orchid), Sardonyx and Alexander, is part of the Erin Adams Collection for New Ravenna Mosaics. Daisies, a waterjet glass mosaic shown in Greta, Rolly (same hue as Radiant Orchid) and Labradorite, is part of the Erin Adams Collection for New Ravenna Mosaics.